If DTC P0011 is displayed with DTC P0075, first perform the trouble diagnosis for EC-180, "DTC Logic". P0011 INT/V TIM CONT-B1 (″A″ Camshaft position - timing over-advanced or system performance bank 1) There is a gap between angle of target and phase-control angle degree. Before performing the following procedure, confirm that battery voltage is between 11 V and 16 V at idle. Maintain the following conditions for at least 6 consecutive seconds. Hold the accelerator pedal as steady as possible. Stop vehicle with engine running and let engine idle for 10 seconds. Is 1st trip DTC detected? YES >> Proceed to EC-171, "Diagnosis Procedure". Maintain the following conditions for at least 20 consecutive seconds. Check oil pressure warning lamp and confirm it is not illuminated. Is oil pressure warning lamp illuminated? YES >> Check the engine oil level. Refer to LU-7, "Inspection". Check the intake valve timing control solenoid valve. Refer to EC-172, "Component Inspection". 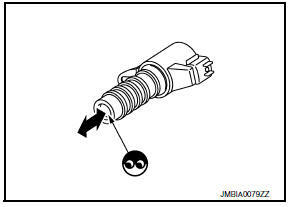 Check the crankshaft position sensor (POS). Refer to EC-279, "Component Inspection [CKP Sensor (POS)]". NO >> Replace crankshaft position sensor (POS). Refer to EM-33, "Exploded View". 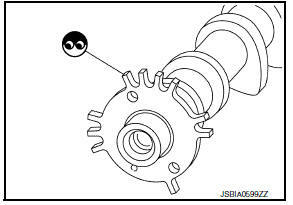 NO >> Replace camshaft position sensor (PHASE). Refer to EM-60, "Exploded View". Check service records for any recent repairs that may cause timing chain misaligned. Are there any service records that may cause timing chain misaligned? YES >> Check timing chain installation. Refer to EM-49, "Removal and Installation". Refer to LU-7, "Inspection", вЂњINSPECTION AFTER INSTALLATIONвЂќ. NO >> Clean lubrication line.